To help coaches and trainers at clubs, sailors, local teams, associations & federations we have been working on gathering all our most used exercises and drills wrapped up in one awesome book of knowledge. We believe that training & coaching are two completely different skills. A good coach is not necessarily a good trainer and the other way around. To help coaches and trainers at clubs, sailors, local teams, associations & federations we have been working on gathering all our most used exercises and drills, wrapped up in one amazing book of knowledge. 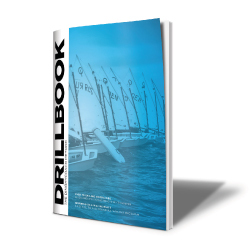 Combined with some coaching tips on how to organize your training session, build a long-term program for a sailor or a team, this book is perfect for all coaches & sailors who need some guidelines or inspiration! "Begin with the end in mind" "Coaching guidlines" "User manual"
"Introduction to boathandling" "Boathandling exercises"
"Winners eyes" "How to think like a winner"
"5 elements to starting" "Starting exercises"
"Introduction to boatspeed" "Boatspeed exercises"
"Introduction to strategy & tactics" "Strategy & Tactics exercises"